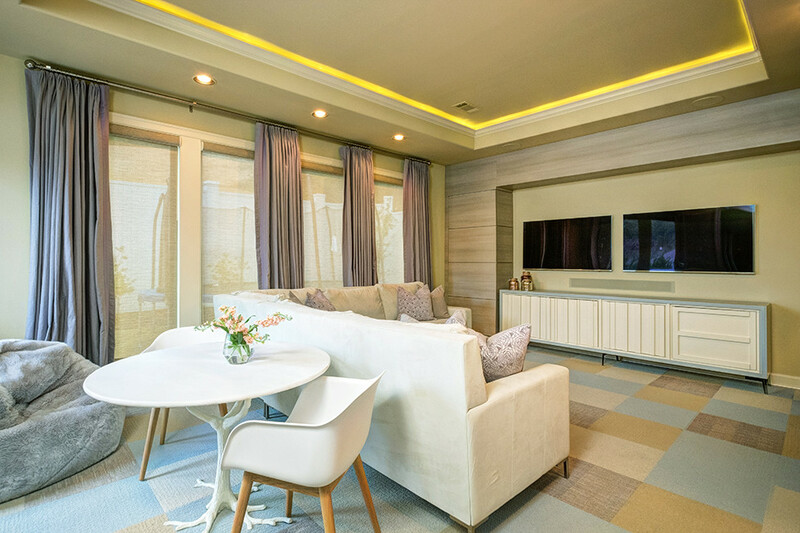 This multi-functional space serves several purposes: playroom, media room, guest bedroom and homework space, all the while maintaining a sophisticated feel. The sectional doubles as a pull-out sofa bed, making the playroom usable as a guest bedroom as well. 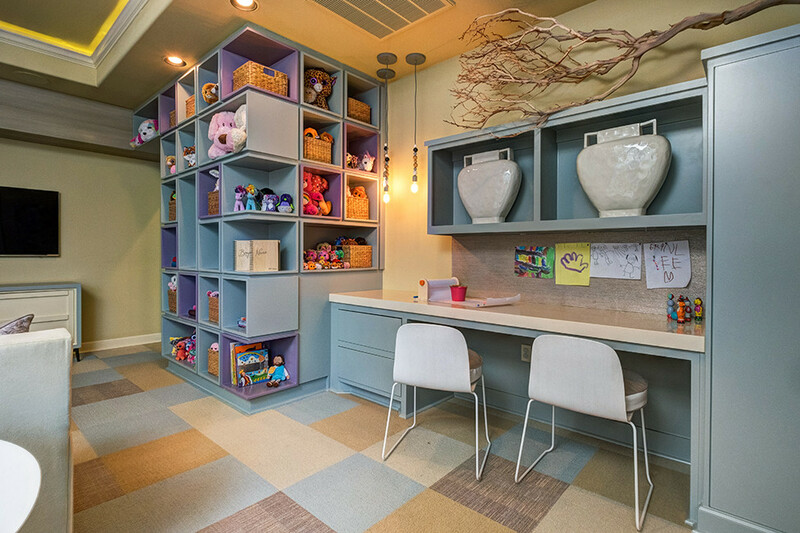 This multi-functional space serves several purposes: playroom, media room, guest bedroom and homework space, all the while maintaining a sophisticated feel. Brittany Atkinson, director of interiors for Williams & Dean Architecture and Interior Design, spilled the beans on how the chic space came to be and how someone might create a similar vibe and room in their own home. What specifically did the client want out of this room? The client approached our firm to do an addition to their house, but they wanted to be careful that it didn’t feel like an addition and it flowed pretty easily ... They wanted it to be an adult space but also a place for the kids to play. In addition, they had maxed out their bedrooms for their children so they needed this to serve as a guest space. That’s something you don’t even really pick up from these pictures because it’s somewhat hidden, but the sectional is actually a pull-out sofa and that up and over detail on the left side is a door that opens for a wardrobe. It’s definitely multi-purpose. 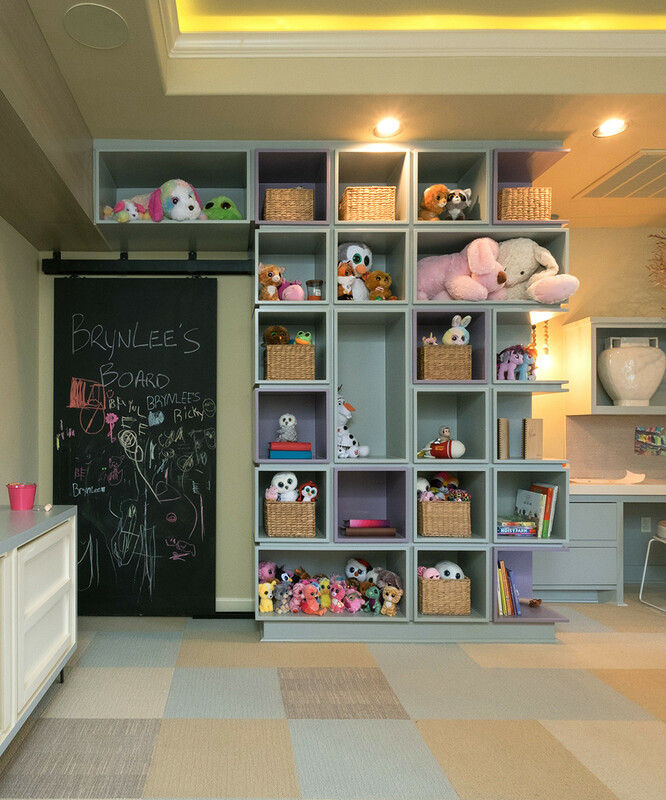 How did you create a space that's comfortable and inviting for both kids and adults? Sometimes you’ll think big pieces of furniture can overwhelm, but we went with a minimal amount of furniture because we know that toys can take over and there’s enough stuff going on with toys. We left everything kind of simple and did built-in desks on the side for them to play and do homework as they grow and then a large sectional that they could all get on … Keeping it really simple, keeping floorspace open. The floor was pretty patterned and interesting so we wanted to show that off. A built-in desk helped keep furniture to a minimum while providing other seating options. How did you select the colors and what are good ways to implement pops of color in a room? In this instance it’s very accessible from the dining area and the kitchen. So what we did, and what you can do on any project, is pick one color and accent it in not too many locations because color obviously resonates. You look at this and immediately pick up that it’s purple but it’s really only in a couple places. You can consider selecting a color that will age well, too. One that’s really soft — like here it’s a soft kind of purple — or go really deep like a navy or other jewel tone that adds color but is also sophisticated. If you did it on items that can be changed out or replaced really easily — like curtains can be replaced easily; we did it on the cubbies but those can easily be repainted. You can also consider doing it as like a wall covering behind a desk. What can you tell us about the flooring? It’s actually commercial-grade carpet tile by Interface … We chose four different colors and one had a subtle textural pattern so it really served a lot as our pattern for the project. Since it’s commercial it has a rubber back it helps the stain not go through. You can also just replace it. You can pop up one tile and go clean it instead of having to move all your furniture and clean the whole room. What was the thought process behind the ceiling-height shelving unit? So they knew they wanted to have storage right now for books and toys because right now their children are pretty young ... We wanted it to look like a big unit and the parents can still reach it. I don’t think people should be scared of having shelving go to the ceiling, you just know that part of it isn’t going to be accessed all the time. But it creates that element of scale and kind of continues the pattern. So don’t be scared to take things to the ceiling. A sliding chalkboard door provides a permanent space for kids to express their creativity.